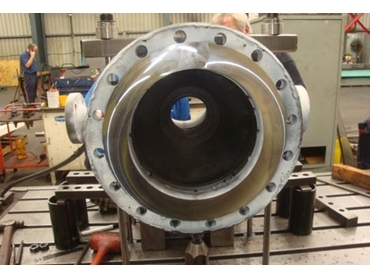 Leussink Engineering refurbished a series of reducing valves that had not been serviced for nearly 30 years. Made from a number of ‘exotic’ alloys for specific tolerances in a very exacting and harsh environment, these reducing valves were used for reducing steam pressure from 4200 kPA down to 2500 kPA. Leussink surveyed the valves, analysed the alloy composition, engineered the required components, and reassembled and returned the refurbished set of valves exceeding 1m² in footprint in a matter of 18 days. The refurbishing was achieved through coordination with third parties and other suppliers. Leussink addresses the needs of most industries with all types of engineering services, prototyping, emergency repair work, machining and manufacturing, welding, and design engineering. Its diverse markets range from small, repetitive parts manufacture through to design, manufacture and repair work for small and large items to the mining sector, railways and dockyards, production plants, construction, agriculture, automotive sector, steel, engineering, maintenance and public works. Leussink Engineering is now in growing demand for specialist engineering services from companies in mining, energy, building and construction, materials handling and general industry. Director Jason Leussink believes that their success and growth over the last three decades is as much about their capability as it is about the relationships they have built with their clients. Leussink also manufactures the innovative demmeler modular fixturing tables for use in any industry where accurate and rapid assembly methods are required, and wherever economical positioning, clamping, tacking and welding are necessary. These modular holding tables can be used in car making, farm machinery and defence products construction, container production, gate and handrail manufacture, mining equipment making, food machine manufacture, building and construction material making and even in the production and reworking of non-metallic parts such as those made of wood, plastic or glass.